Oops - we don't appear to have a video for the RoadWarrior 3. 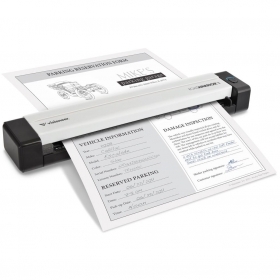 The Visioneer RoadWarrior 3 is the perfect mobile scanning solution for users who need to scan a wide variety of documents regardless of where they are. Weighing a little more than a 12 oz bottle of water with dimensions similar to a rolled up magazine, it packs easily in a laptop bag and is powered by the USB port so you can scan anywhere – even when AC power is unavailable. With the RoadWarrior 3, you can scan your receipts, business cards, magazine articles, newspaper clippings and even photographs – fast. This versatile compact scanner will handle any document up to 8.5" (216 mm) wide and 32" (813 mm) long and convert to PDF, JPG and most popular file formats. The RoadWarrior 3 produces clear and sharp scans of any document, in colour or black and white. Worried that your highlighted notes from the meeting won't scan clearly? What about the receipt that was folded in your pocket? Real world documents are never a problem for the RoadWarrior 3. Visioneer Acuity technology enables the scanner to instantly improve the visual clarity of every scanned image. You get perfect scans from imperfect originals. Why wait until you get back to the office to organize that stack of paper in your briefcase? After all, it's not the paper you want to keep; it’s the information on the paper that is important. RoadWarrior 3 includes a powerful suite of bundled software designed to help you organize and find the information important to you. Once all of your papers are scanned and organized, you can easily send them and share the valuable information they contain with your team, clients or headquarters. When you scan documents into a searchable PDF format, that information can be shared with anyone and quickly found later when it is needed. Much easier and faster than sorting through that stack of crumpled papers in the bottom of your briefcase! So, what are you waiting for? This is one travel companion that you want sitting next to you. And it will never ask to share your snack while you're in flight.